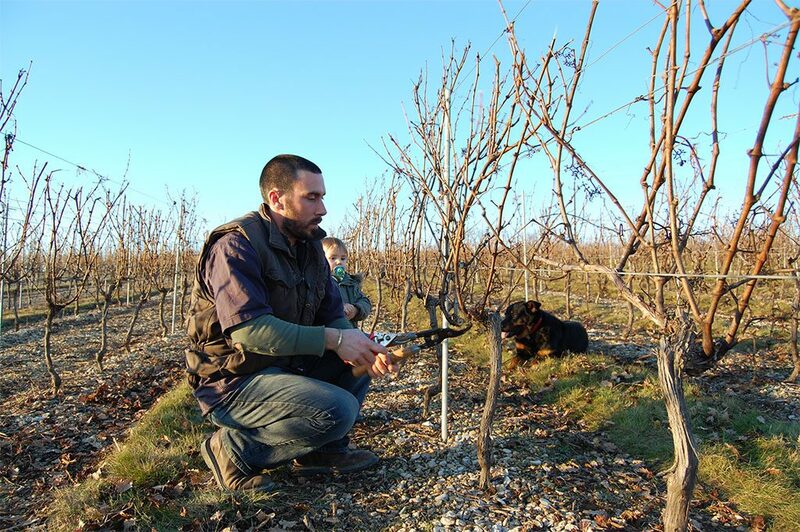 The ever-innovative Emmanuel (Manu) Rybinski is without question Cahors’ hottest young star. Overseeing 24 acres on the plateau of Villeseque, Emmanuel Rybinski tends to some of the best terroir in Cahors. Emmanuel’s 24 acre estate sits atop an iron rich plateau on the southern border of the appellation. The iron chunks scattered atop this vineyard are so pure you could sell them to a smelter. The property is unusually high in elevation with allows Emmanuel to farm organically with ease (he is above the fog line and therefore has no issues with mildew). Rows are plowed by horse and spaced tightly. In 2005, the operation was classified under rational agriculture and in January 2014, Clos Troteligotte became certified organic. The Rybinski family home is equally impressive – An off the grid Eco/DIY masterpiece Emmanuel created from a 17th century stone barn. K – nom Enticing red cherry aromas lead you into a sip of this well-made Malbec/Merlot 985/15%) blend. Your palate is immediately filled with fresh berries, but there is underlying complexity as the earthy notes become apparent. Silky-smooth tannins and pleasant minerality allow this Cahors Malbec to shine a very bright light on a very old corner of France.